Mount St. Michael Catholic School envisions graduates pursuing their God-given purpose to transform the world for Christ. 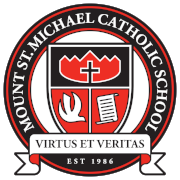 Mount St. Michael Catholic School forms students in courageous virtue grounded in the truth of Christ: to reason clearly, to choose morally, to serve faithfully. As an apostolate of the Christian Community of God’s Delight, Mount St. Michael Catholic School collaborates with parents as primary educators to provide, through example and instruction, a Catholic community in which students experience the Gospel of Jesus Christ, in obedience to the Magisterium of the Roman Catholic Church, and under the auspices of the Bishop of Dallas. Recognizing the Lord as the source of all truth, we foster the child’s relationship with God the Father, God the Son, and God the Holy Spirit. Acknowledging the child as an integrated person with dignity, the school focuses on the child’s spiritual, moral, intellectual, social, aesthetic, and physical development, while accommodating diverse learning styles. Using developmentally appropriate and solid pedagogy, we stimulate, encourage, and advance the basic principles of learning, while keeping fresh the challenge of Christ’s message to human living today. It is our aim that students will not only master basic skills, but continue on a lifelong journey of learning and living their faith.